Whether you plan to take a full load or just one class, TCC offers a range of options to prepare you for the next step. Even though the holidays are upon us, it’s the perfect time to plan for next year. Attend Tidewater Community College’s open house on Dec. 1 from 9 a.m. until noon and learn everything TCC. Whether you plan to take a full load or just one class, TCC offers a range of options to prepare you for the next step. The college offers short term certificates –phlebotomy, trucking and numerous information technology options among them – in addition to transfer programs and full associate degrees. Love the fine arts or tinkering with cars? TCC has a center dedicated to the arts and its own automotive training facility. 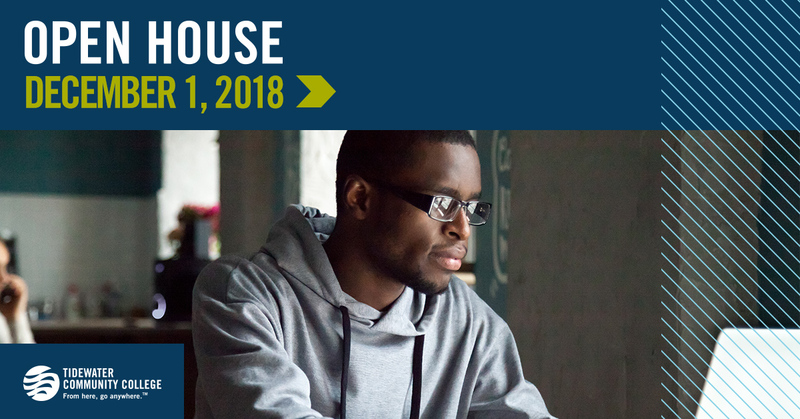 Find your favorite among 150 programs and apply for admission onsite at open house. You’ll also be able to receive help with financial aid and tour the campuses. We’d love to know you’re coming, so email us at enroll@tcc.edu, and feel free to ask a question there, too. Walk-ins are also welcome. Call 757-822-1111 for more information or visit tcc.edu/admission/open-house.